Work being done in the old ticket room at Union Station. Photo: Metro. In 2011, Metro purchased Los Angeles Union Station, the hub of our region’s rail system and a busy bus stop for Metro and other providers. •The painting of the station’s exterior. •Restoration work of metals and woodwork at the station. •Work in the passageway under the train platforms including removal of non-historic tile, painting and resurfacing of floors. •Installation of new signs as part of a property-wide master signage program. •Slurry, striping and installation of the ‘Pay on Foot’ program at Parking Lots B and D.
Work on the projects is being scheuled to minimize disruptions to passengers at Union Station and all design work has been monitored by architects specializing in historic preservation. 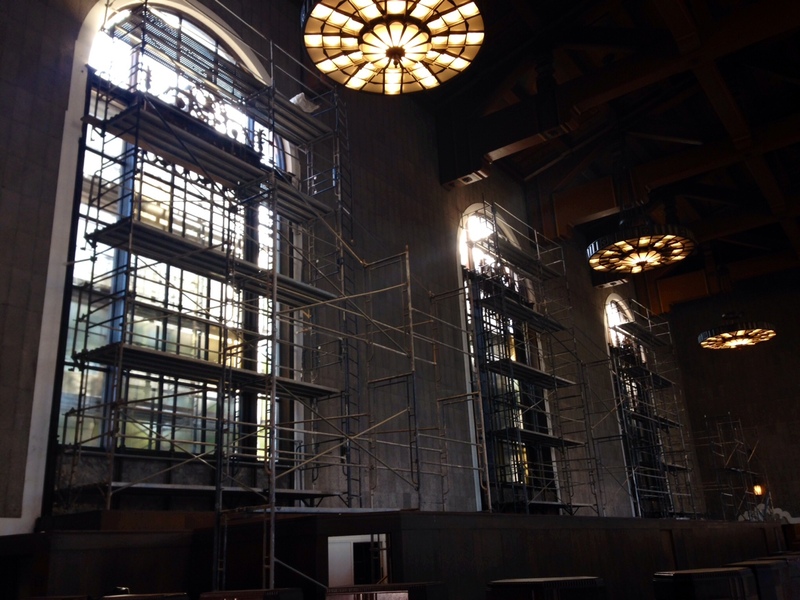 The projects are scheduled to be completed by May 2014, in time to celebrate the 75th anniversary of Union Station. Good it is about time; Union Station has needed to be updated for a long time. When will Metro build a ramp to replace the stairs between the Gold Line platform and the tunnel? It is crazy to expect people to carry bikes and suitcases up the stairs. It takes too long to use the elevator and miss the train. Crossing fingers that they strip the paint from and polish the solid brass door frames throughout the station. A few years ago these beautiful doors were painted over and look awful. Any plans for the 75th anniversary? Any special trains coming? Santa Fe 3751 to operate a special train? Please keep us updated, I should add that that day will fall on National Train Day (or very close to it, May 10) as well, so I really hope for a BIG event at Union Station! Yes, Metro is planning to celebrate the station’s 75th in May and we’ll have more details as they are finalized!